Janice Lee is a writer, artist, editor, and curator. She is the author of KEROTAKIS (Dog Horn Press, 2010), a multidisciplinary exploration of cyborgs, brains, and the stakes of consciousness; Daughter (Jaded Ibis, 2011), Damnation (Penny-Ante Editions, 2013), a book-length meditation on the films of Béla Tarr, and Reconsolidation (Penny-Ante, 2015) She also has several chapbooks Red Trees, Fried Chicken Dinner (Parrot/Insert Press, September 2012), The Other Worlds (Eohippus Labs, June 2012), and The Transparent As Witness (Solar Luxuriance, 2013), a collaboration with Will Alexander. 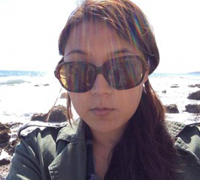 Janice currently lives in Los Angeles where she teaches at CalArts, is Assistant Editor at Fanzine, Executive Editor at Entropy, and Founder/CEO of POTG Design. She can be found online here.